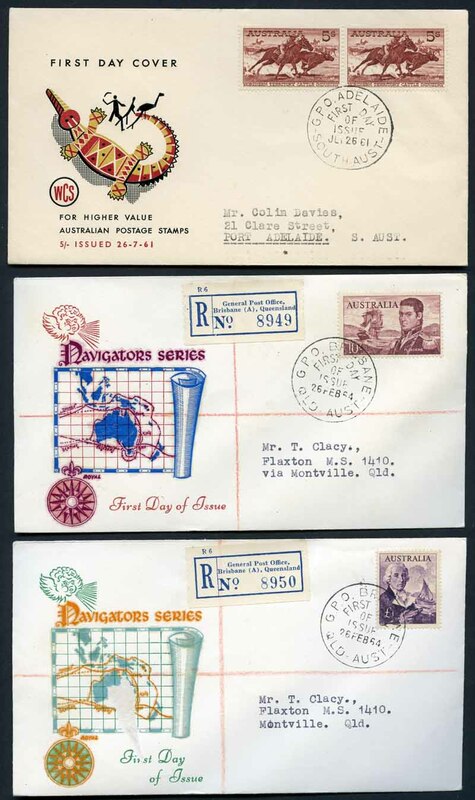 Selection of 200 mainly illustrated addressed Pre-Decimal FDC's from 1937 to 1965 including many stamped with blocks of 4 and some registered covers. 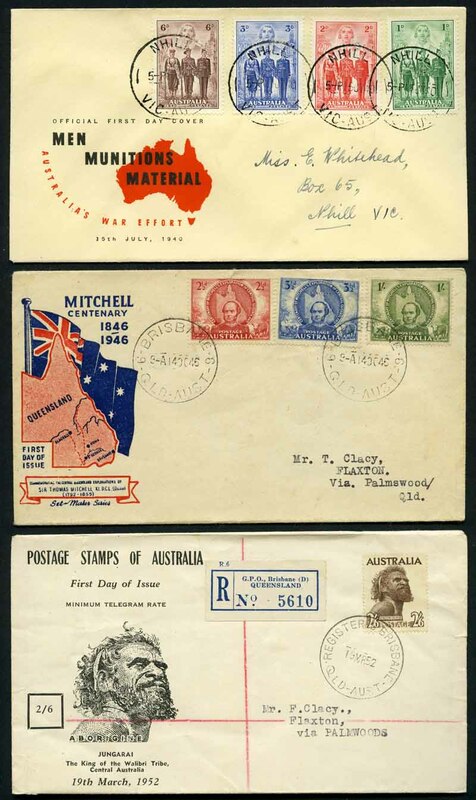 Noted 1937 NSW Sesqui set, 1938 9d Perf 13½ Platypus (2), 1940 AIF set (2), 1946 Peace set, 1946 Mitchell set (2), 1947 Newcastle set, 1949 1/6 Wmk Hermes imprint block of 4, 1952 1/0½d KGVI block of 4, 1952 2/6 Wmk Aborigine (2), 1953 Food strips of 3 set, 1953 Coronation set, 1953 Tasmania Sesqui set (2), 1954 Royal Visit set (2, plus blocks of 4 set), 1954-55 2/- Blue and 2/- Green Olympic Games Publicity blocks of 4, 1955 Cobb and Co blocks of 4 set, 1956 Melbourne Olympics (2, plus blocks of 4 set), 1958 2/- Qantas (3, inc block of 4), 1958 5½d War Memorial pair (3), 1959-64 Flower set, plus blocks of set excluding 1964 2/3 Wattle, 1959-62 Animals set in blocks of 4, 1961 5/- Cream Paper Cattle (2), 1963 Commonwealth Games set (2), 1963 Royal Visit set (2), 1963-64 Navigator set on unaddressed WCS covers, 1963 2/3 Cable (2), 1964 Airmail set, 1964-65 Bird set of 7, 1965 Anzac set (2) and 1965 2/3 ICY block of 4. Mainly Wesley and Royal covers, but includes some Wide World, Mappin & Curran, Set Maker (Laker), Miller Bros, Challis, Covercraft, Turley/Mappin and Standard Stamp Co. Some, generally minor blemishes or faults. Very high retail value. 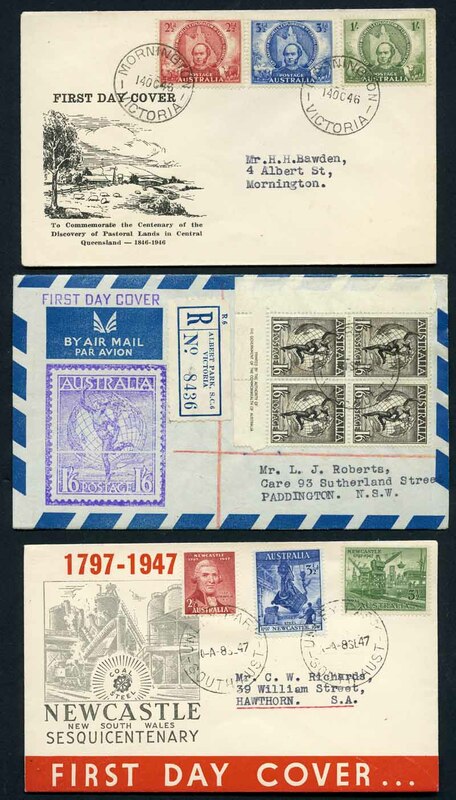 Selection of 148 Pre-Decimal and 86 Decimal illustrated FDC's from 1937 to 1973 with a mixture of private and Official Post Office types, addressed and unaddressed, with some light duplication. 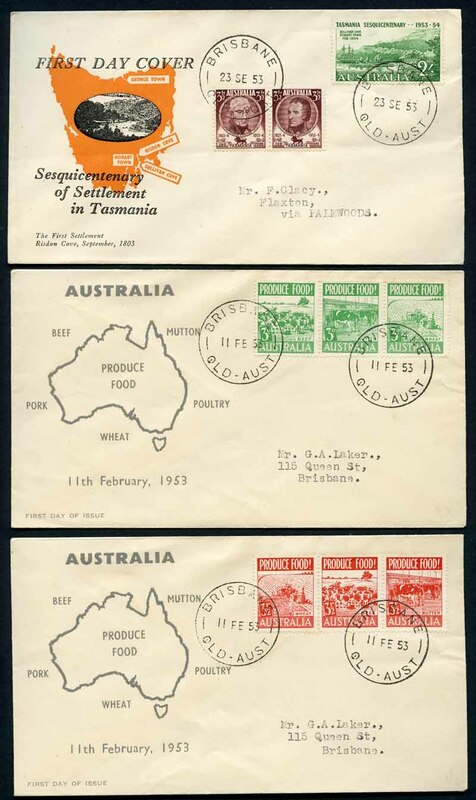 Noted 1937 NSW Sesquicentenary set, 1940 AIF set (2), 1968 Soil and Medical gutter pair (2), 1971 Christmas block of 7, 1972 Primary Industries set (2) 1972 Christmas set (2), Australian Antarctic Territory 2/- Map cancelled at 3 different bases, 1959 Definitive set (2) and more. 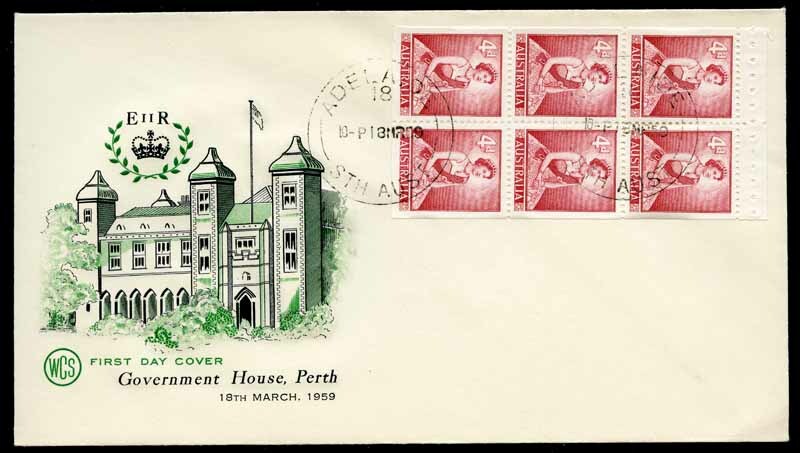 Accumulation of 484 illustrated Decimal FDC's from 1966 to 1978 including 1966 Definitive set of 24 on typed addressed Australia Post logo covers and some AAT. Majority addressed WCS and Royal covers with many duplicates. Odd minor blemish. Collection of 310 illustrated Decimal FDCs from 1966 to 1970, including 1966 Definitive set of 24 and many other handy items. Majority are unaddressed WCS and Royal covers. Some duplication and minor blemishes. Accumulation official unaddressed FDC's from 1970 to 1991 including some handy earlier covers (Face Value $358.00), 11 mint and 31 cancelled on FDI PSE's and 41 covers with commemorative cancellations. Flaps sealed on a few. Also shoebox of Australian and Foreign mint and used stamps on and off paper, sorted into packets, noted some useful mint Victorian stamps and a few trade cards. Selection of official unaddressed FDC's with main strength in 1974 to 1979 period with the odd private cover (Face Value $374.00), selection of covers with special postmarks (Face Value $36.00), 88 earlier Pre-Stamped Envelopes cancelled on FDI (Face Value $19.00) and 288 mint earlier Pre-Stamped Envelopes (Face Value $58.00). Odd minor fault, but generally fine condition. 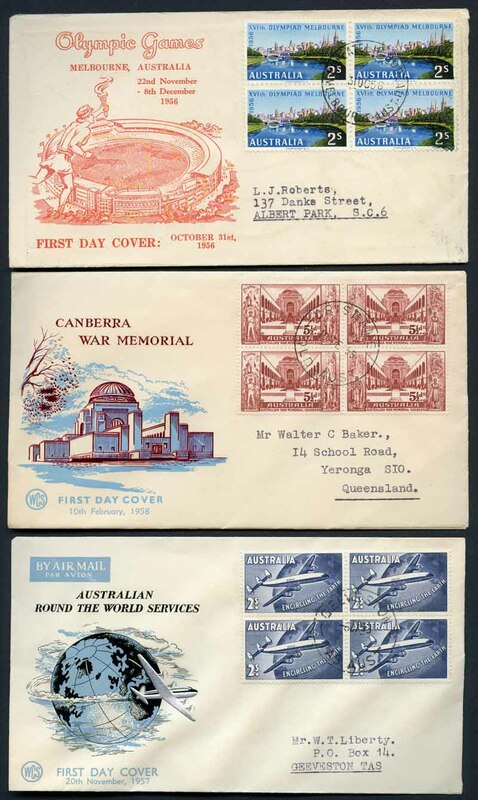 Accumulation of official unaddressed FDC's from 1974 to 1999 comprising 9 covers of each, including Joint Issues and Australian Antarctic Territory. Face Value $6,250.00. 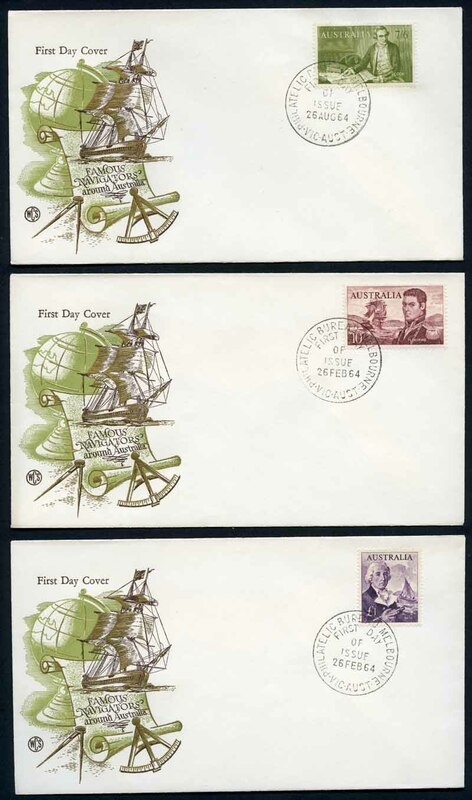 Collection of official unaddressed FDC's from 1974 to 2011 including Joint Issues, Australian Antarctic Territory, Christmas Island and Cocos (Keeling) Island Australian issues and odd duplicate. Face Value $1,685.00. Accumulation of official unaddressed FDC's from 1974 to 2006, including some Joint Issues and Australian Antarctic Territory. Some mostly light duplication, with good variety. Face Value $1,450.00. Collection of official unaddressed FDC's from 1974 to 1995, including some souvenir covers and Australian Antarctic Territory (Face value $645.00) and 245 mint PSE's (Face value $85.00). Also range of miscellaneous covers and Decimal off paper mixture. 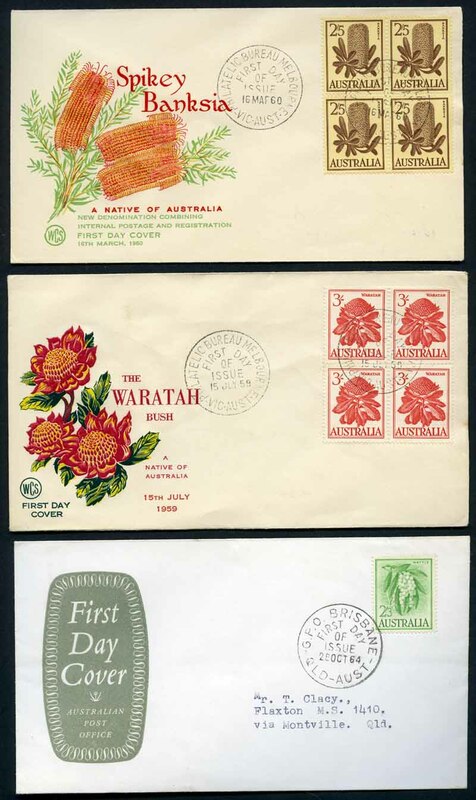 Accumulation of many hundreds of FDC's with main strength in the 1970 to 1982 period, most are Official unaddressed covers, but includes some private or plain covers with special postmarks and range of Australian Territories and Pacific Islands. Face Value $822.00. Varying duplication and odd fault. 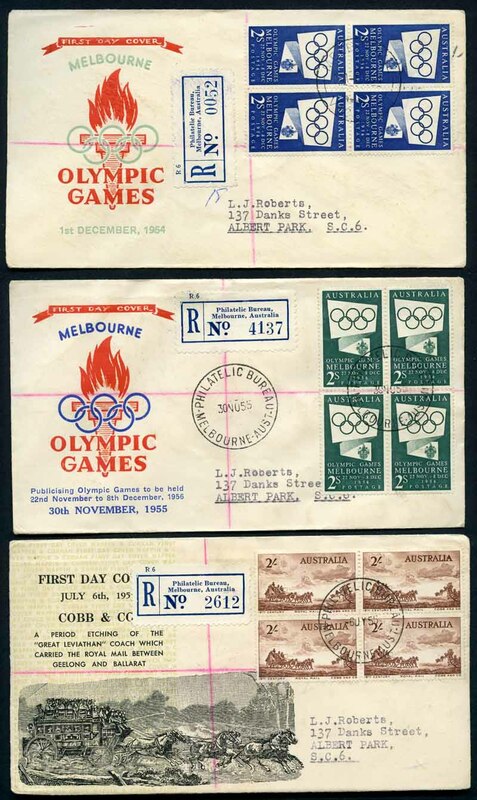 Also 1976 Red, 1978 Blue and 1981 Brown (2) postcard packs cancelled with special or relevant postmarks. Collection of official unaddressed FDC's from 1979 to 2014 including Joint Issues, Australian Antarctic Territory, Christmas Island and Cocos (Keeling) Island Australian issues and odd duplicate. Face Value $2,713.00. Also 184 mint and 319 cancelled FDI PSE's from 1978 to 2013 (Face value $185.00) and 1976 Red, 1978 Blue, 1981 Brown and 1982 Black postcard packs and 1988 Expo 60¢ and 80¢ postcard set of 6 mint. Accumulation of official unaddressed FDC's from 1980 to 1990, plus 178 mint and 136 cancelled FDI PSE's from 1978 to 1987, including some souvenir covers with special postmarks. Some duplication. Face Value $601.00. 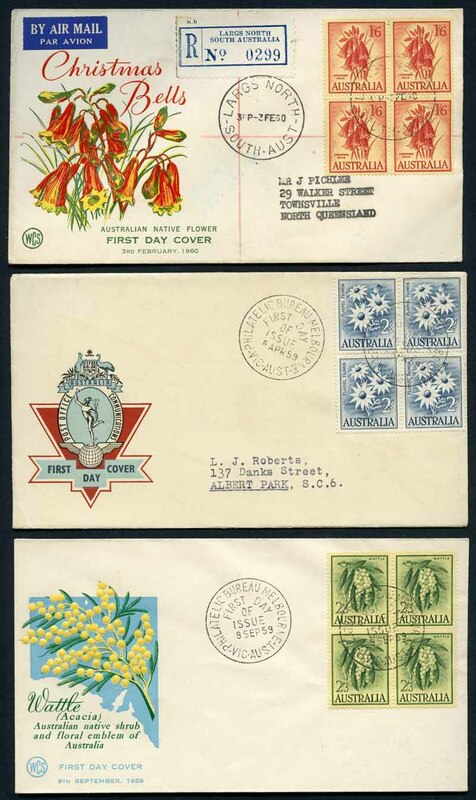 Selection of mostly modern official unaddressed FDC's, but includes a range of earlier Decimal official and private FDC's and a small selection Australian and Foreign Postal Stationery items. Noted 1970 5¢ Grasslands on official unaddressed FDC. Odd fault, but mostly in fine condition. Face Value $465.00. Collection of official unaddressed FDC's from 2005 to 2013, including AAT, Christmas Island and Cocos (Keeling) Islands Australia. Face Value $679.35. 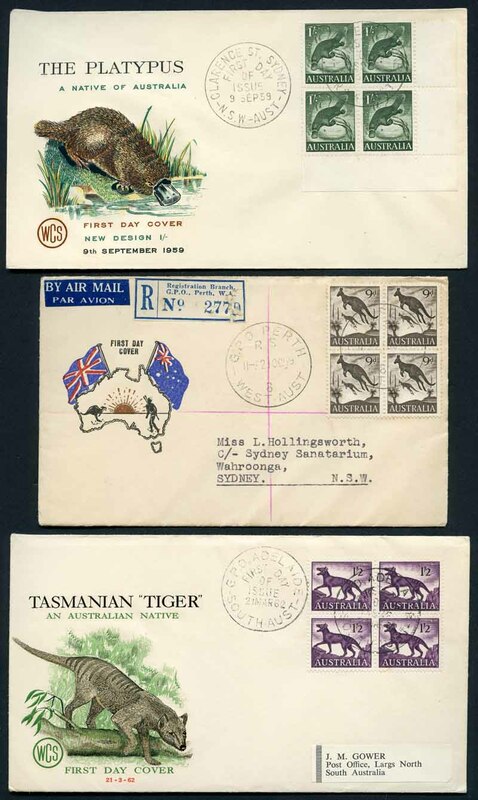 Selection of 69 FDC's from 1960 to 1981 including 1966 Definitive set cancelled at Mawson, Wilkes and Macquarie Island bases, 1971 Treaty set, 1972 Cook set and 1973 Definitive set cancelled at all 4 bases. Mainly neatly addressed WCS covers. Accumulation of official unaddressed FDC's from 1979 to 2004 including many base cancel sets, blocks of 4 and duplicates. Face Value $1,055.00. Accumulation of official unaddressed FDC's from 1993 to 2012 with varying duplication. Face Value $740.00. Selection of 170 FDC's from 1973 to 1991 (Face Value K196.00), 237 covers cancelled with special and commemorative postmarks, 359 Pre-Stamped Envelopes mixed mint and cancelled on FDI and a few miscellaneous items. 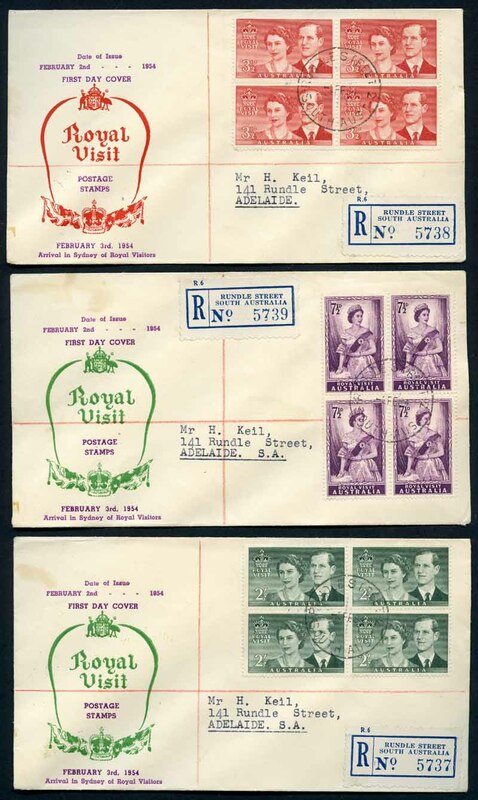 Also 82 mint Norfolk Island Pre-Stamped Envelopes. 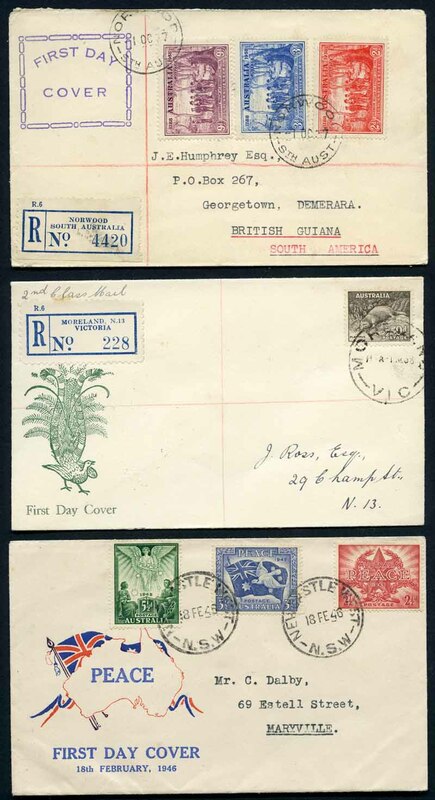 Accumulation of 765 illustrated FDCs from 1959 to 1969, comprised mainly of India, Papua New Guinea, Cyprus, Fiji, New Zealand, Cook Islands and Gilbert and Ellice Islands. 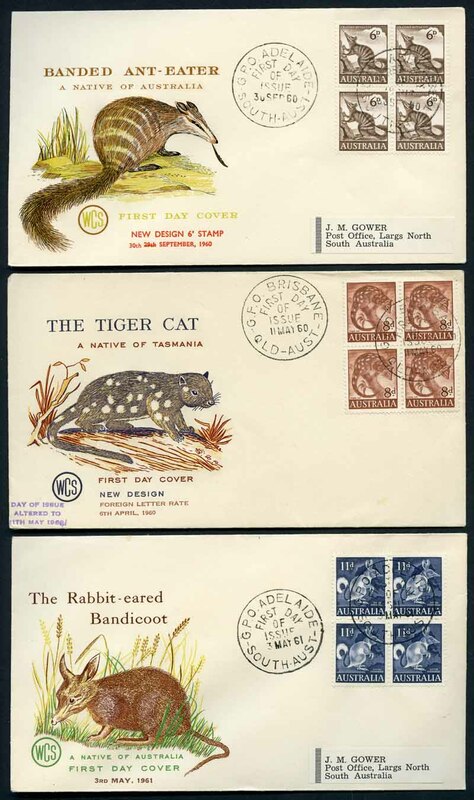 Majority unaddressed with varying duplication, including up to 9 covers of each. 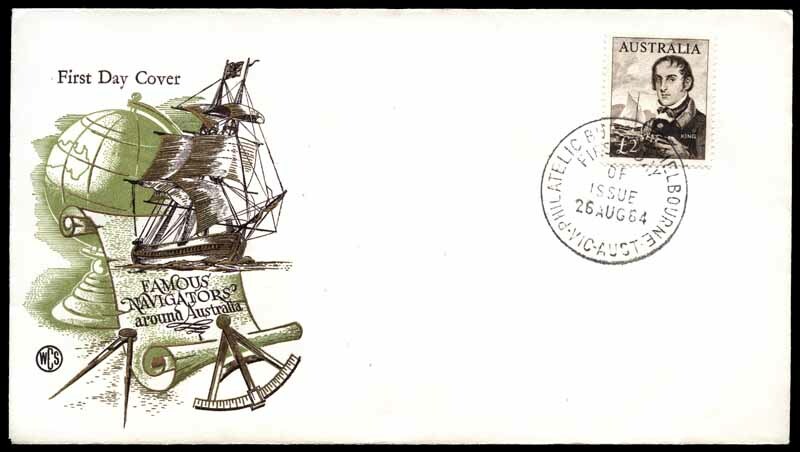 Selection of 50 official unaddressed illustrated FDC's featuring French Art issues from 1961 to 1974. High catalogue value. Accumulation of 575 mainly illustrated FDC's from 1931 to 1988, including some Patriotic covers and postal stationary items, plus 124 picture postcards from 1906 to 1954, many featuring building and street scenes. Also accumulation of used stamps off paper in small box, packet of pre-cancels and small range of mint stamps.